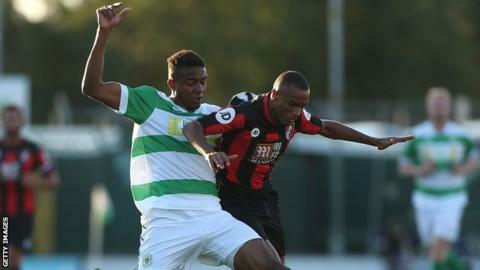 Yeovil Town defender Stephen Arthurworrey has been forced to cut short his season-long loan deal from Fulham through injury. The 21-year-old had made 17 appearances for the Glovers this season. The centre-back was forced off during the 1-0 defeat by Mansfield last week with a knee injury. "He went back to Fulham and had an X-ray and there is knee damage of some sort," Yeovil manager Paul Sturrock told the club website. "They have explained that he is going to need an operation and that obviously puts him out of contention here. It's a massive blow." Yeovil have been struck down by injuries all season and remain without long-term absentees Ben Tozer and Kevin Dawson. Sturrock was only able to name six substitutes for his side's 3-2 home defeat by Cambridge on Saturday. The club's misfortune continued on the training ground last week, when an unnamed trialist, brought in to boost their wafer-thin squad, was forced off with an injury after just 12 minutes.